Kinzler VP of Operations Tim Hurn (center) is presented the Patriot Award by ESGR volunteer Michael Dayton (left). Hurn was nominated by Iowa National Guard Commander Craig Coder (right), a Kinzler employee. 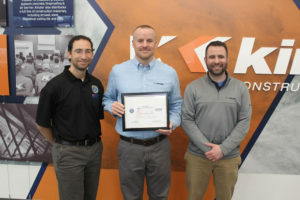 Kinzler Construction Services was recently recognized for exemplary support of National Guard and Reserve member employees. 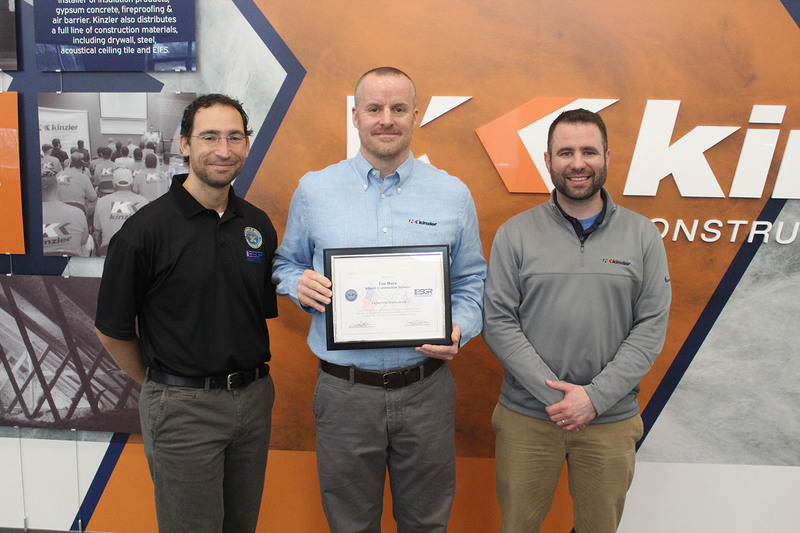 Tim Hurn, VP of Operations for Kinzler Construction Services, was named a Patriot Award recipient by the U.S. Department of Defense. The award, given by DOD’s Employer Support of the Guard and Reserve (ESGR), recognizes individuals who practice leadership and personnel policies that support employee participation in the Guard and Reserve. Hurn was nominated by Iowa National Guard Captain Craig Coder, who serves as the Commander for Alpha Company, 334th Brigade Support Battalion based out of Camp Dodge. Coder is the General Manager of Kinzler’s eastern Iowa Distribution operations. Kinzler actively seeks out National Guard soldiers and people with prior military service and is a Home Base Iowa employer. Interested applicants should visit www.KinzlerCareers.com. Kinzler Construction Services is a leading installer of insulation products, gypsum concrete, fireproofing & air barrier. Kinzler also distributes a full line of construction materials, including drywall, steel framing, acoustical ceiling tile & EIFS. Kinzler is a rapidly-growing, employee-owned company offering industry-leading service to the best customers with locations across America’s heartland. To search job openings and apply to join the Kinzler team, visit www.KinzlerCareers.com.